In the video below John Robson warns that real federal authority may have seeped away into the bureaucracy and thats its time to LIMIT the size of government. 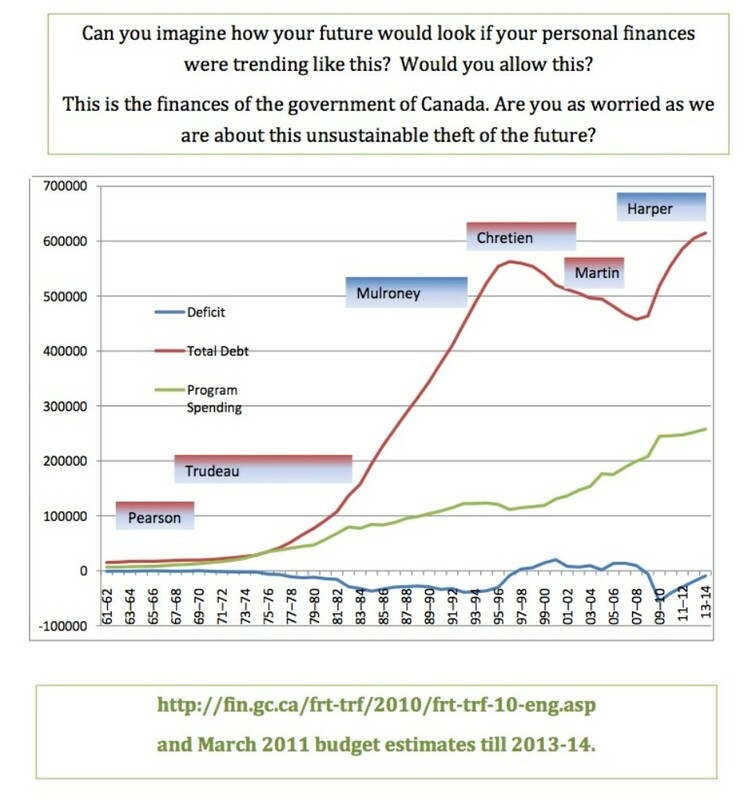 These are the Federal finances - not including Provincial debt and deficit. · Bring our brave soldiers home now! · Support the right of citizens to challenge Parliament through citizens’ initiatives and referenda. What is the proper role of government in a free society? Canada, like many countries, has in the last 60 years become a welfare state. Our Federal government has grown to such an extent that it takes between 40 and 50% of the annual wealth produced by Canadians just to sustain the government. Beyond that, governments at all levels borrow money from the private sector at home and abroad to supplement tax revenue. The debt has grown to staggering proportions. Though Canadian governments are living "beyond their means", other countries are in far worse shape and that of course is the basis for the current world-wide economic malaise. Libertarianism challenges the basic premise behind the growth of the welfare state - this view that what the state perceives as “the common good” should be forced on all of us - and it challenges the idea on two fronts. In the civil area, Libertarianism supports all civil liberties and opposes all attempts by government to reshape its citizens’ lives. In the economic area, Libertarianism challenges the right of government to restrict trade in any way, or to force citizens to support through taxes, projects they would not willingly support in a free market. Libertarians do not look at government as a sacrosanct body that cannot be questioned, but simply as the agency in Canada, which has a monopoly on the legal use of force. Libertarians therefore address themselves to one basic question: What is the proper justification for the use of government’s coercive power? The Libertarian answer is that government power must be used only to protect the individual from the use of force or fraud by others. Our western civilization has generally come to accept the idea that society should not be subject to the arbitrary wishes of a ruler. But although we have done away with the divine right of kings, we have merely substituted, for that idea, the absolute rule of “the majority.” But individuals can be equally repressed in a totalitarian dictatorship or a statist democracy. In contrast to the Libertarian idea that each individual owns his/her own life, in all statist societies, the individual is to a greater or lesser extent owned by the state. The principle that the state, somehow representing “society as a whole,” owns the citizen's life, explains many laws in Canada today. The state controls its citizens in order to obtain its own ends for the supposed good of all. The state judges what books a citizen may read, what movies may be viewed and what prices s/he may charge for his/her goods and services. The state enforces observation of the religious holidays of its choice. In Canada the state “redistributes” the individual’s wealth, penalizes him/her if s/he buys the products of another country, expropriates his/her land if it finds a “better” use for it, and finally decides what health services are appropriate if the individual is ill. Naturally, all such actions are done in the name of the “national” or “public” interest, the common good. Today, when the rights of the individual remain unacknowledged, “public interest” is usually decided on the basis of the pressures exerted by various lobbying groups. Libertarians have chosen not to participate in this competition among pressure groups, each vying for favours for their own particular group, and instead call for the end of all government grants, loans, subsidies, tariffs, and other such favours designed to benefit certain individuals and groups at the expense of others. Libertarianism states that government should offer equality to people not in the forms of equal pay, equal housing, or equal happiness, but instead, in the form of equal opportunity to earn these things in voluntary dealings with other people. Although Libertarianism is idealistic, it is not utopian. It does not seek to remake people according to some Libertarian vision of the good. Instead, it holds the view that each individual must be left free to work out his/her own destiny and government must not interfere with the voluntary arrangements people make among themselves. This is the Libertarian ideal, which we believe would benefit all people living in such a society. Certainly it is evident that the countries with the greatest protection of the individual’s liberty are also the countries with the greatest prosperity for its entire people. Most Canadians already accept the basic principle of Libertarianism - the right of the individual to pursue his/her own goals without coercion from others. The single exception occurs where our government is concerned. Most people still accept government’s prerogative to restrict our freedom as long as it is proclaimed that somehow it is for the “greater good.” What Libertarians seek, is to apply the same rules that now prevent one individual from interfering with another to the government. Libertarians believe that the ever-growing power of the state in Canada is stifling us all. But the villain is not government itself, but instead the belief that all problems can be solved by government. To counter this doctrine Libertarians are promoting an idea, the idea of personal liberty and responsibility. We would not stimulate economic development by mortgaging our children’s future. We would not send our brave soldiers to pointless foreign wars. Don't waste your vote on more of the same.